Japan-based chemical producer Nagase announced that it invested ¥500 million Yen ($4.6 million USD) in Hyperfluoresence TADF materials developer Kyulux. Nagase is currently offering materials for LCD producers, so this is likely to be a strategic investment for the company. Kyulux’s first aim is to develop commercial red, green and yellow hyperfluorescence emitter/host combinations, to replace the 2nd-Gen phosphorescent emitters currently used in OLED displays and lighting panels. 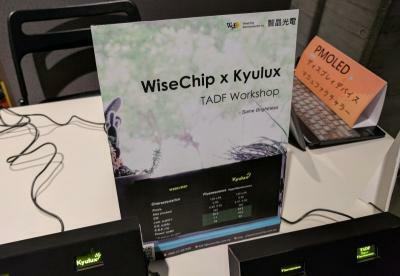 In 2017 Kyulux announced a collaboration with PMOLED maker WiseChip to bring Hyperfluoresence TADF emitter based displays to the market by the year's end. In July 2017 Wisechip demonstrated a yellow HF PMOLED (which consumes about 50% of the power compared to Wisechip's fluorescent yellow PMOLED), but that display hasn't been released yet, hopefully this will happen soon. Kyulux is also developing a deep-blue emitter but that will likely take more time to reach the market. Kyulux was established in 2015 as a spin-off from Kyushu University, and the company announced its first financing round in 2016, raising $13.5 million from LG Display, Samsung Display, JOLED, JDI and others.